This past weekend was my boyfriends birthday. When I asked him if he wanted any particular type of birthday cake he looked at me and said "cookies?!". 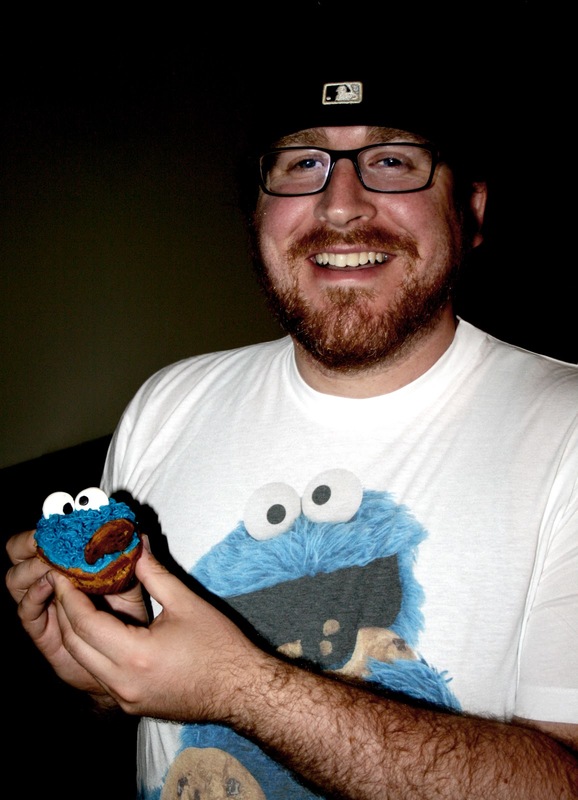 I should have known... Matt is a COOKIE MONSTER! Most days when I ask him what he wants for dinner I get "cookies" as a response. Greaaaaaaat, thanks for the suggestion! Torn between the fact that cookies don't exactly scream birthday celebration I came up with the perfect idea for his birthday treat. 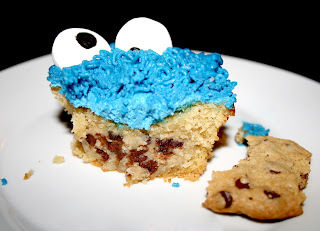 I've seen people make chocolate chip cookie dough stuffed cupcakes and I've seen people make cookie monster out of cupcakes so I figured why not combine the two for the ultimate birthday treat?! Most people would look at this cupcake and think it's perfect for a toddler's birthday but I made it for my 29 year old boyfriend who never wants to grow up. Honestly, I hope he never does! These cupcakes were really dense and had perfectly doughy cookie batter in the center. For me it was an overload of sweetness but the birthday boy claimed they were "the best cupcakes he's ever had". I'm not going to lie... they were a lot of work to pull off but I have some great improv suggestions below to make them a lot less time consuming and completely approachable for the non-baker! cream butter and sugars together until light and fluffy. add milk, vanilla extract and mix until incorporated. Add flour and salt and combine until dough forms. Then add in mini chocolate chips! Roll into small balls (about 2 T. in size). Place in freezer for at least 2 hours. This can be done a day or two before. if you don't want to make your own cookie dough, you can buy your favorite tube at the grocery store and roll that into balls. This will save you tons of time and it will turn out just fine! just make sure you use a cookie dough that doesn't have eggs! you wouldn't want to risk getting sick. Preheat oven to 350º. In a large mixing bowl, cream butter and sugar together until light and fluffy. Add in the eggs, 1 at a time. In a smaller bowl, combine flour, baking powder, baking soda, and salt. Slowly add in the dry mixture, alternating with the milk. You want everything to be nice and smooth. Adding in a little milk, then a little of your dry mixture will make that happen! Finally, add in your vanilla. Line a cupcake pan with 24 liners. Fill each one about ⅔ full with the batter. 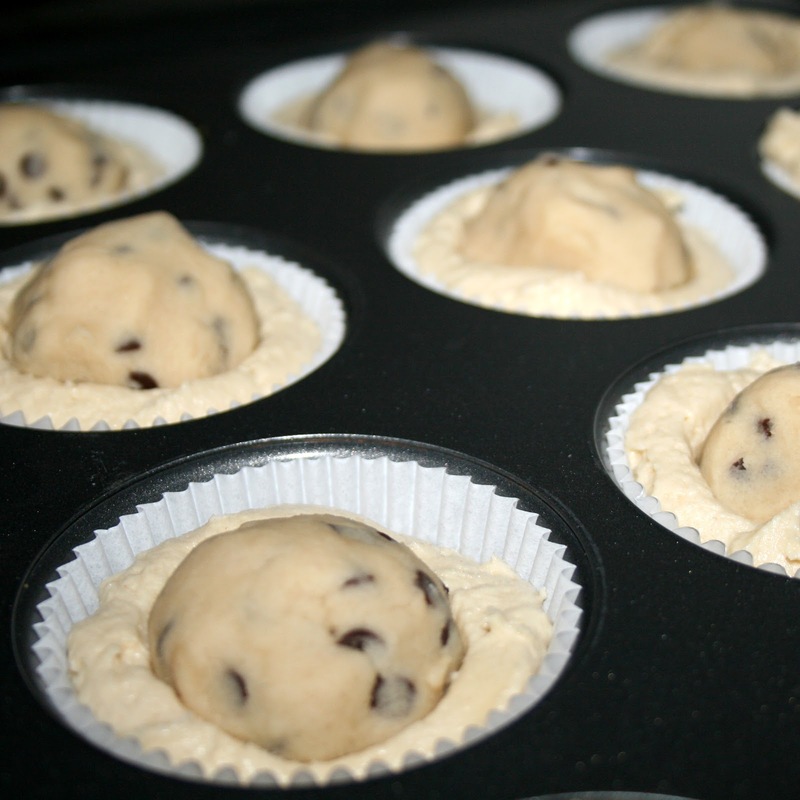 Place a frozen cookie dough ball in the center of each one. Bake about 15 - 18 minutes depending on your oven. Let rest in the pan for about 20 minutes. I was impatient and it didn't work in my favor... learn from my mistakes! you can use your favorite vanilla cupcake recipe here. if you wanted, you could even use a box mix to save lots of time. just follow the directions. also, you could play with the cupcake flavor here... chocolate, funfetti, red velvet. whatever your favorite with cookie dough would be! cream butter and sugar in a mixing bowl. Slowly add in powdered sugar. Finally, add in milk, vanilla, and salt. Combine until smooth and creamy! Finally add in enough blue dye to get the desired color you want. I used a gel color that I got at Sur la table but you can use whatever you have on hand. use your favorite frosting recipe here OR you can even use a store bought frosting. i prefer homemade to store bought but that's just me. if making everything from scratch is intimidating, take a few cheats... no one will know! you could also try dying shredded coconut flakes blue and using that if you don't have a decorating tip. Once cupcakes are cooled, take a little of the frosting and spread around the tops. You don't want to use too much, just enough to get a little base started. Fill a piping bag (or ziploc bag) with remaining frosting. I used a multi-opening tip like this one. If you don't have that, you can punch a few holes in the tip of your ziploc bag or just frost it like you usually do. Frost each cupcake... the more imperfections, the better! After all, this is cookie monster! 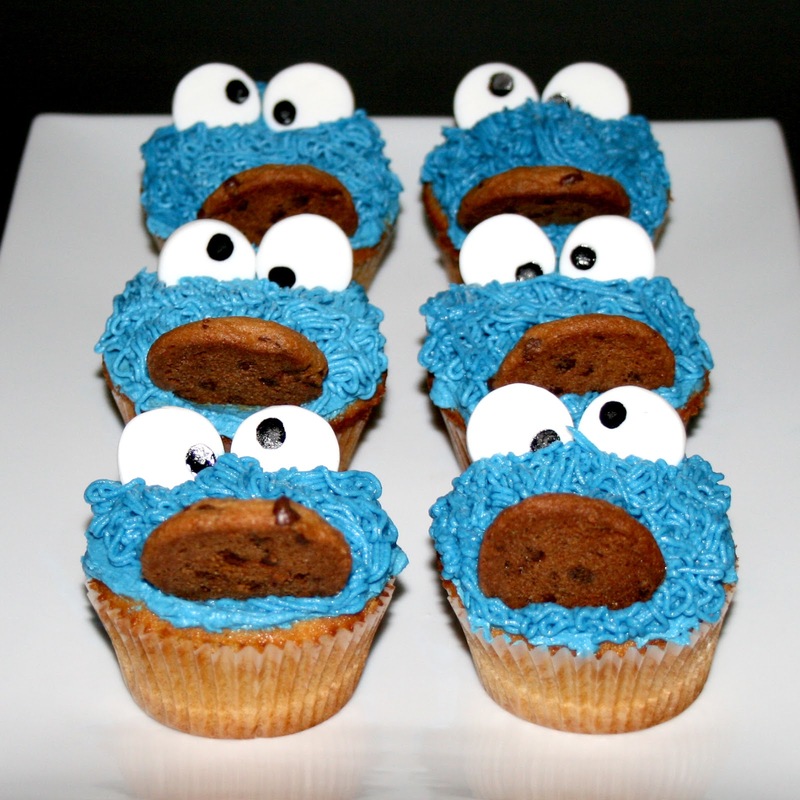 To make the eyeballs, roll out some fondant (I bought mine but you can make yours if you're feeling really ambitious. Cut into small circles. I didn't have a small circle cookie cutter so I used a decorating tip to make them. If you don't have fondant, you can make the eyes with marshmallows, sugar cookies - get creative! Then I took a q-tip and dipped it into a black food dye gel. If you don't have this you could use chocolate chips or melted chocolate. Finally, you're ready to assemble! Take your mini chocolate chip cookie* (home made, store bought, whatever you prefer!) and stuff it near the end of the cupcake edge. Place 2 eyeballs at the top (be sure to have the eyes looking different directions). That's it! A lot of steps, I know. But totally worth it! 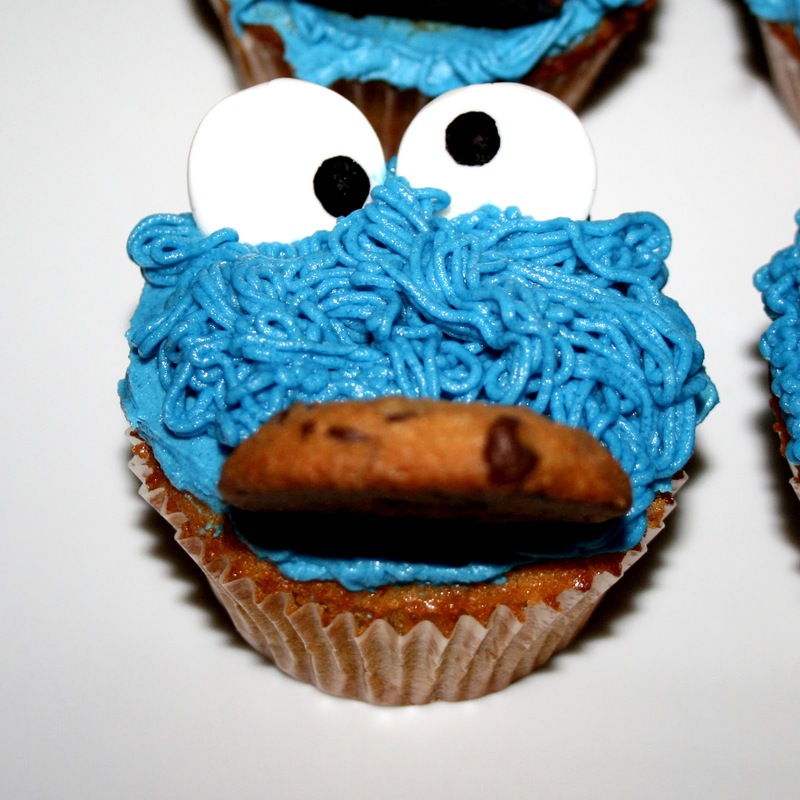 you don't even have to make these cupcakes look like cookie monster! you could leave out the food dye, pipe the frosting on top and garnish with a mini chocolate chip cookie or chocolate chips. you could make this ultra sophisticated or keep it playful. even decorating can be improvised! * I improvised my fully loaded cookie recipe by halving it, and substituting the nuts and chocolate chips for 1 cup of mini chocolate chips. 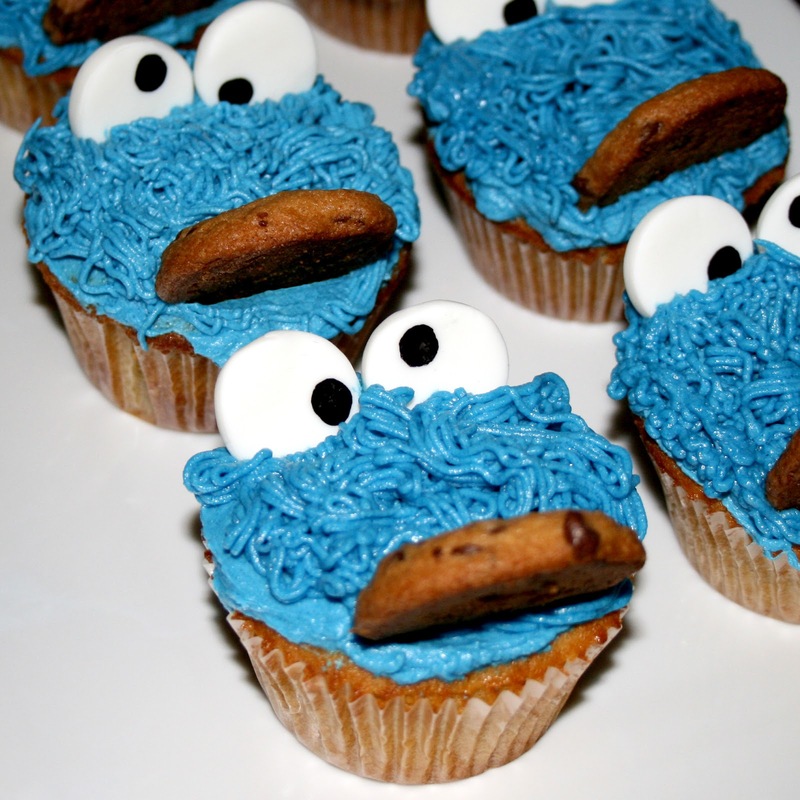 You can make mini versions of your favorite cookie recipe or use a store bought one. You could even buy a pre-made dough and roll them into smaller cookies. Find whatever works best for you.